Day 14 – Pregnant? Drink Quinoa Milk! 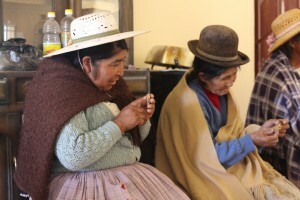 In 2015 the European Community working with social investment organization Pro Bolivia run by Bolivia’s Ministry of Productive Development and Plural Economy and partner, Foundation FAUTAPO, a Bolivian foundation formed in 2005 with help from the Dutch embassy, helped open the world’s first quinoa processing plant here in Uyuni. Costing $160,000, the quinoa milk processing plant was 80% funded by the European Community and 20% funded through FAUTAPO. The local quinoa growers cooperative, Central de Cooperativa Agropecuarias Operación Tierra (CECAOT), was chosen as the recipient of the plant. Today the plant makes quinoa milk for the national pregnant and lactating moms program – providing organic quinoa milk to moms across the nation. The first year of the program went well and the product in chocolate, vanilla and strawberry flavors, has been well received. CECOAT just got its quinoa milk contract renewed with the national government for another year, proudly explained cooperative treasurer, Lourdes Ticona. Today I am meeting with Ticona, the treasurer of this 280-member cooperative. CECAOT is formed by 12 smaller cooperatives who each are members of CECOAT. 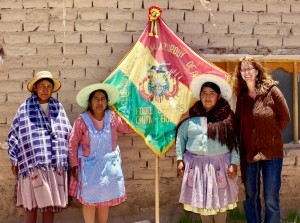 Founded in 1973, it is one of Bolivia’s oldest cooperative organizations. It is managed by a 50-50 balance of men and women leaders. Ticona herself is the daughter of quinoa growers and her father was a member of CECOAT. Before being voted as Treasurer, Ticona spent three years working with micro-credit loans and worked 8 years at CECOAT as well. The CECOAT quinoa milk contains many amino acids, mainly lysine, which in children, helps memory retention by multiplying brain cells, according to the US National Academy of Sciences. Public schools in Bolivia provide this to children as part of their school breakfast – especially in the ColchaK region where much of the quinoa is grown. The milk is essentially made with quinoa, sugar and colorants, explained Ticona. It stays fresh in sealed packages for 15 days without refrigeration and 3 to 6 months with refrigeration. Costing just $.20 for a 50ml. pouch of milk, this is an affordable snack for Bolivia’s school children. 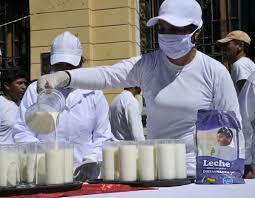 Many Bolivian mayors are contracting CECOAT’s quinoa milk this as part of their school breakfasts. Besides making milk, CECOAT also makes quinoa bread, cookies and cakes. In all, this consumes about 10-15% of their annual quinoa production, explained Ticona. The rest is exported under Fair Trade and organic certificates which CECOAT manages with the strictest controls. “It’s easy for us to manage our certificates,” explained Ticona, “working ins mall cooperatives we are able to verify all of the norms of production for each producer.” CECOAT also have a team of ag. technicians who help with production and a Committee of Control with a Vice President who is a part of the CECOAT board. I remembered several times, years ago, when CECOAT was struggling with its leadership and development. I asked Ticona about this and she agreed, CECOAT had gone through some rough times. Working as a cooperative, she explained sometimes this happens. However, the cooperative structure demands that members work together. In time leadership changed and now the organization is in a period of strength and growth. They are hoping to close a deal on 8,000 quintals (661 US tons) of quinoa that they recently got a contract for from a Peruvian trade show. They are waiting for the laboratory analysis to come back to confirm the organic nature of the quinoa. CECOAT pays $3,000 a year for their organic certificate from IMO Cert. Ticona feels confident their quinoa will come back with a clean laboratory review and will be accepted for the organic, Fair Trade quinoa contract. The women quinoa growers of Chita – Modesta, Nilda and Rosali – committed to coming to La Paz to present their experiences in person. 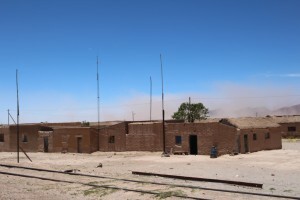 Along the dusty road leading to Uyuni lies the tiny railroad town of Chita, founded in 1939 and named perhaps for the Chita plant or rain or water – it is not certain. Home to 40 permanent families, it once was a thriving quinoa producer zone. Now the towering dust devils skirt past empty fields, the wind whistling through the tin roofed adobe dwellings. A nursery is there – to grow the ancient tolla brush that once held down the dry, fragile soils. And so is the Chita Club de Madres, a group formed over a decade ago as part of a long forgotten development project. The 14 women club members, all quinoa growers, meet regularly to discuss needs, plan events and organize themselves for different projects. Today’s project was the arrival of me, a quinoa researcher from the US. 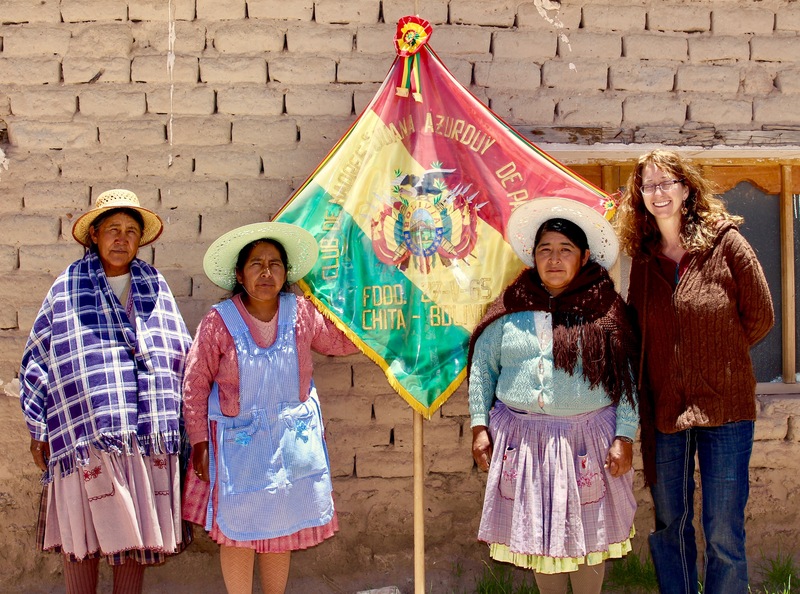 The local quinoa research organization, Proimpa, invited me to the site when they heard I was looking to contact women quinoa growers – they had been working on the tola nursery there for many years and knew the women’s group well. Martin, a Proimpa agronomist from the Chita, dropped us off as he headed off to check on the vivero and other projects. We would be picked up again in 4 hours. The women invited us to their meeting hall, a cold, dusty room accessed through a metal door made from an old oil drum cut apart and pounded flat and an outdoor patio where an adobe wood fired stove stood in a corner. We proceeded with our workshop – talking of sustainability and laughing at the women’s jokes and jabs at one another. It was a jolly group and we found ourselves having quite a fun time. The workshop ended and we stayed on talking. The windswept salt flat outpost and train stop of Chita. And they spoke of their recipes – cookies, breads, pito, cakes, pisha q’alla made of red quinoa, mokuna… each variety with its own set of recipes. I asked if the varieties could be interchanged in the recipes. Absolutely not they all said in unison, laughing at their timing. Bread and pito can only be made with kaslala, Toledo is only for soup, etc. I noticed, however that outside of the quinoa growers’ kitchens very few Bolivians and no one from outside Bolivia were using quinoa that way. For example, the many varieties of white quinoa were simply mixed together and sold as all purpose white quinoa. When they were not all purpose at all. In the women quinoa grower’s kitchen never would the varieties be mixed and used as an “all purpose,” impossible! Each variety had a purpose – even as medicine and healing. Quinoa preparation and cooking was a tradition build on thousands of years of ancestral experimentation and testing passed from mother to daughter. Seeds were selected and stored to preserve the best properties of each variety. Farmers very intentionally choose which varieties to grow, what quantity of each, and the placement of the seeds in their fields. They know what the seed heads look like and can easily name each seed variety, even when they are closely mixed in the fields or in different stages of development. Farmers know the leaf and stem colors, head shapes and characteristics and colors. An agronomist told me the quinoa seeds do not cross pollinate and each variety maintains its own characteristics. Chita women sample KIND bars from the US – a processed food product that features quinoa. In Chita this year each family is growing an average of 10-12 different varieties on 20 acres each. In other times, they would plant 60 acres, but with price so low, the weather so varied and the drought, it made no sense to invest to much into quinoa production. Twenty acres is just fine they explained. Even with that, they are noting, it seems there will be a 70% loss of crops from the drought. Yields vary from 2 tons to less than 1 ton per acre depending on climate effects – the women were expecting yields of less than a ton per acre this year. Bio-indicators, such as rodents’ homes with covered entrances, are predicting an early frost which can easily kill off developing seed heads and turn developed seeds black and unusable. Harvest is in May. There is no remedy for frost, they women just have to wait and hope for the best. Modesta, an older woman with graying braids asked me what I was going to do with the information they were giving me. I explained it would be presented in a presentation at Catholic University in La Paz in February. She lamented how people are always talking about the quinoa and the women, but never let them speak for themselves. I explained that I worked with full transparency and that the women were welcome to come to La Paz and present their story during my presentation. She said that the would come. At first I thought she was joking. La Paz was very far away – a 15 hour trip by bus. Rural women were usually shy about traveling outside their family and were rarely able to anyway, with their obligations to the family, children and farm – plus jealous husbands did not like their wives to be away from home. But Modesta was not joking and neither were Nilda and Rosali who also said they would travel to La Paz as well. I was stunned. This was great! To have real, authentic women’s voices at the presentation – what a brilliant idea. I was in. I quickly named them the three musketeers – which got them cracking up all over again. We formed a plan: they would cook the bread, cookies and pito with different quinoa varieties for the presentation participants. They would also present the Bolivian kitchen and women’s experience – about 15 minutes – with questions and answers afterward. I would pay for their travel and food and buy the products they produced, plus give them an extra tip (yapa) for their time and effort. They were in. We exchanged phone numbers and planned to see each other in a few weeks, at the time of the scheduled presentation. The time was up. The women had to cook and check on their quinoa. 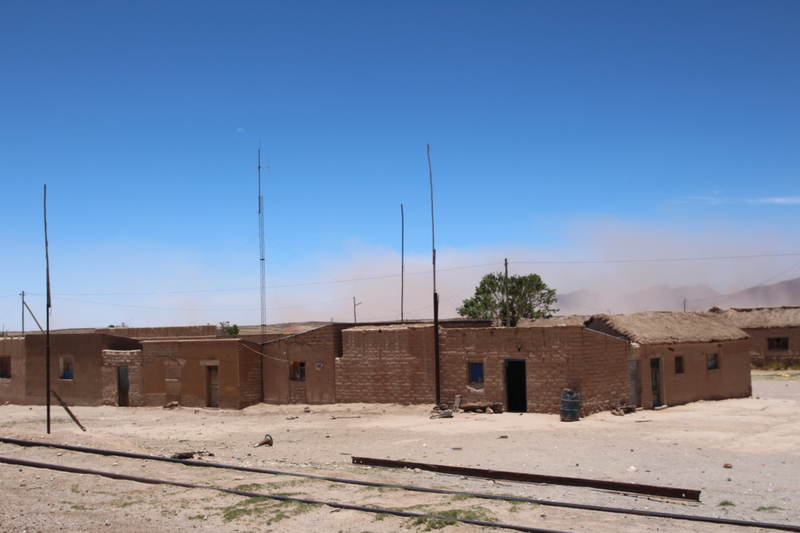 We walked along the empty railroad tracks, the wind blowing against us, sand blowing into our ears and mouth – to find the agronomist, Martin, and get our ride back to the town of Uyuni 20 minutes away. Three weeks later – I was at the bus station in La Paz at 8 in the morning, picking up Modesta, Nilda and Rosali for the presentation! 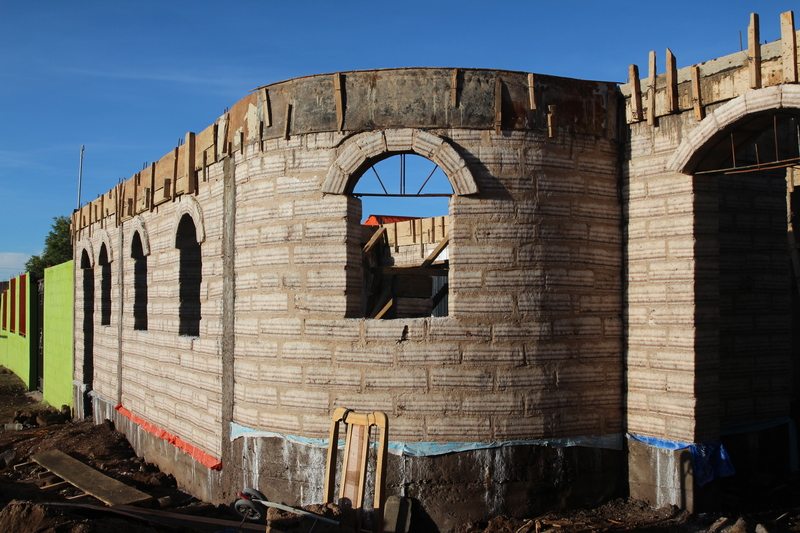 A new tourism salt hotel under construction in the quinoa community of Chuvica. When one arrives in Uyuni, the Potosi capital of the Quinoa Real, one sees a dusty, salty outpost with low adobe houses, a few cement and brick hotels, many salt flat tour offices and not much else. This town of 10,000 people receives 60,000 tourists from all over the world, mostly European, Asian and South American backpackers – who are visiting the salt flats as part of a larger tour of Chile or Peru. Tours take two to three days and cost more than $100 each. The tourists are young, educated, have money and time to travel. 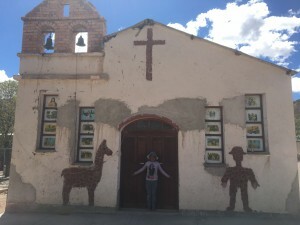 They are interested in the culture and natural environment of Bolivia but in Uyuni they are greeted with tourist restaurants serving beer and pizza, roadside food stands with fried chicken and thick cut French fries, Bolivian soups and dishes made of beef, rice and little else. On the salt flat tours, tourists are served largely noodles. The tourist shops sell alpaca clothing, tiny trinkets carved from salt and little bags of salt. No quinoa! …Not even a plant in the plaza or a dried, decorative quinoa seed head in a hotel lobby. 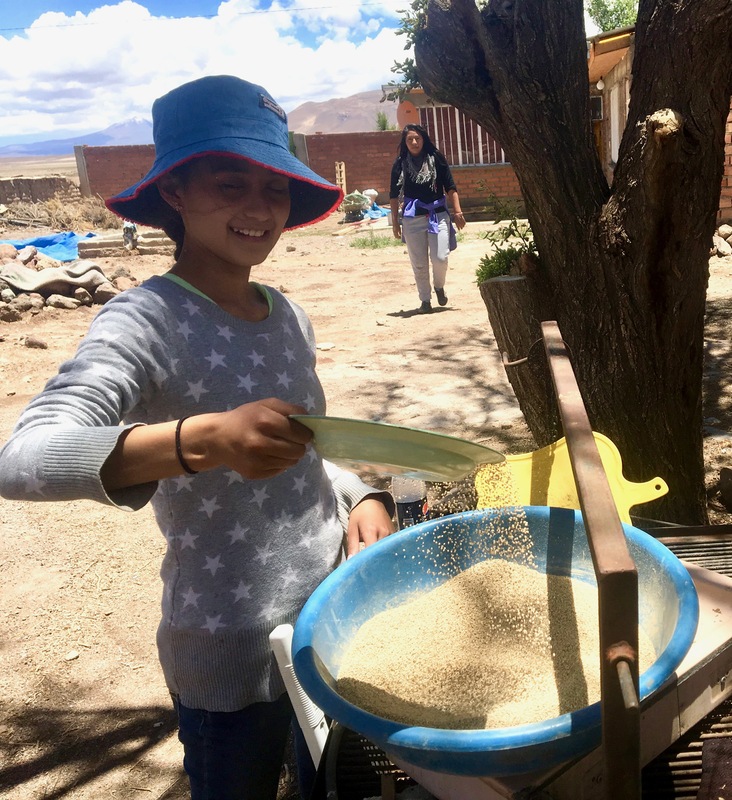 These are young people who would love to learn about quinoa, eat it and then consume it in their home countries – where this is Bolivian quinoa for sale – becoming lifelong loyal Bolivian quinoa customers. What an opportunity! The town crier rings these church bells to announce town meetings. Gladys’ niece poses for a photo- #quinoatoursim! I was even more surprised to travel to the far away quinoa communities of San Juan, Santiago, Puerto Lluvica and Lluvica to find tourist hotels of salt, anthropology museums and tour vehicles arriving regularly, with no integration or participation with the quinoa growers themselves, who are literally living next door. I thought of all of the agro-tourism we have alongside regular tourism in my state of Vermont, where we also have small, isolated, organic producers making largely artisanal producers – at premium prices. I saw opportunities for tourists to learn to plan, hoe, and harvest quinoa. To prepare quinoa for cooking in Bolivia’s many traditional ways – to have a quinoa culture center in each town where tourists can spend the afternoon thrashing seed heads, separating chaff, toasting grains over an open fire of tola plants, hand washing and grinding the grains with a stone and cooking soups, pito and pisaga. They could herd the llamas, learn to turn the soil, even pack-up loads for llamas to carry and eat a lunch outside with the other herders. Harvest festivals and planting tours could be developed including separate quinoa tours that brought participants to the communities for several days. Most communities had amazing pre-Inca ruins, cave paintings, and other natural wonders to explore as well – plus the community’s culture itself with ample festivals, music and traditions. My dughter Musi enjoys learning to cook with quinoa – Bolivian style. Quinoa communities asked about tourism – all wanting to engage in it but not knowing how. I told them the story of how I worked with the mayor or Mizque, 15 years ago, to develop the first Annual Fruit Festival there – which is still going on. I helped the community of San Juan to map out their resources and see how they can work together more with the tourism industry and existing infrastructure to create a strong quinoa identity in the town of Uyuni and its surrounding communities. The communities were interested but still felt very detached from the tourists – who in one instance participated in a village festival by dancing and getting to know community members and in another instance wanted to know more about the quinoa seeds I had. So there is interest. The challenge is to bridge the communication and culture gap between the tourists and the Bolivians and more importantly the Bolivian tourism community and the quinoa farmers themselves. An opportunity came by the other day when my American friend, Anna, who lives in Cochabamba and works on educational exchanges for Santa Clara students, mentioned an interest in doing more work in Uyuni. I pitched the idea of students spending six weeks in the quinoa community of San Juan working with local people to develop a quinoa tour route and tourism. Gladys the point person in the community was thrilled and so was my friend… we’ll where it all goes! 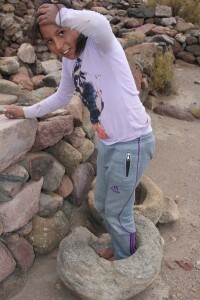 Marita demonstrates how quinoa was (and still is) processed by foot – grinding the grains in a course stone bowl to remove the bitter husks. This quinoa grinding bowl is 3,000 years old! So how long has quinoa been cultivated and consumed in Bolivia? 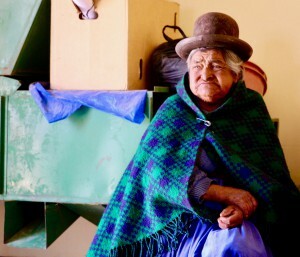 If you ask the people from the salty frontier towns of Santiago, Chuvica and San Jaun – huddled at the base of the mountain range circling the salt flats just a few miles from the Chilean border – they will tell you 3,000 years. In this region is the ancient city of L’kalla, a large array of huge chunks of meticulously placed coral and stone forming round rooms with windows that align with each other – looking out in the four directions over a vast expanse of dry sand and distant salt flats. Narrow corridors wind amongst the vast array of structures, leaving one to wonder what the hilltop city would have looked like 3,000 years ago when it was said to have been a busy seaside port. Pottery shards, an arrowhead and turquoise trading beads found at the L’kalla site. Evidence of trade and prosperity still exist. The town is encircled on the one side by a vast array of chulpas, stone tombs where the remains of ancestors were stored – mummified in baskets, and brought out for village celebrations. Though the mummies were removed and sent to museums long ago. 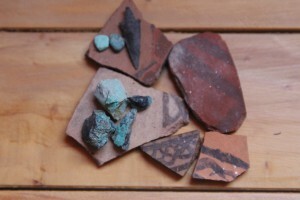 Tiny arrowheads used for fishing, pieces of intricately decorated pottery, turquoise beads once used for decoration and trade along the Chilean coast and carefully hand carved bone and shell buttons can still be found in the sandy soils amongst the abandoned village. Years ago, a small study of the city was done dating it to 3,000 years old. Grains of quinoa and quinoa grinding bowls can be found there as well. 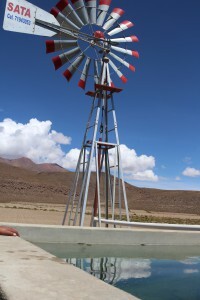 Chuvica’s wind pumps from Argentina. Each pump provides irrigation for 11 families and a total of 4 acres of crops. 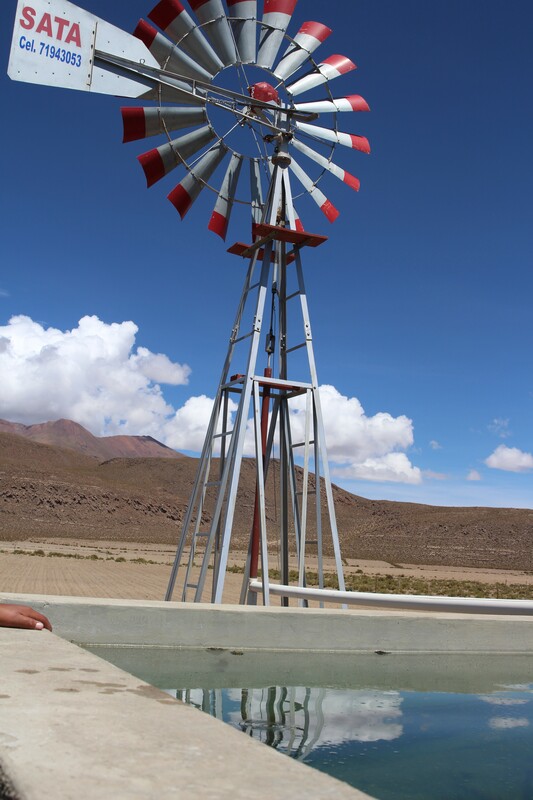 Gladys’ father had a vision – wind driven water pumps to bring the rich, sweet waters to the dry salty, windswept, lakebed for better and more varied crop production. Quinoa can grow well in arid environments but potatoes and fava beans, other favorite crops, need more water. He built a wind turbine that fed a large water tank that could be tapped for gravity fed irrigation in nearby areas – carefully tending it, making repairs and improvements, until at last it ceased to function any more. The tank cracked and the turbine gradually rotted into a metal heap but the memory of wind turbines water pumps lived on. Last year, the tiny community of 25 permanent citizens and 60 visiting residents – families who come in for annual festivals and to plant or harvest quinoa – worked with their elected village representatives (dirigentes) to request funding for a wind pump project. They researched the best systems and ended up choosing pumps designed in Argentina which worked like hand pumps for bicycle tires. The turbines produce air pressure which pushes the water out of the ground and into adjacent tanks. No electricity is generated, it’s just air pressure, wind and water. The mayor invested $1,000 for each wind turbine ($8,000 total) and the people of Chavica provided the labor, sand, stone and cement to build eight large 1,000 liter water tanks – one for each turbine. The eight wind pumps, light giants descended from the surrounding mountains, now greet visitors as they barrel across the floor of the vast inland sea in a rickety old bus with thick, deep-treaded tires. Over hundreds of thousands of years, the vast ocean evaporated to become the Uyuni Salt Flats and its surrounding sand, salty ocean floor. 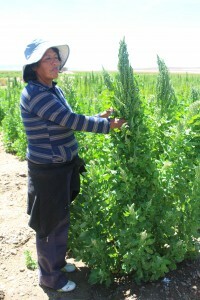 Gladys and the large quinoa plants in Chuvica’s irrigated wind pump gardens. Visiting the new gardens – which appear like an emerald oasis in a sea of dried, tan soils – we see the bright green foliage of healthy potatoes, onions, garlic, carrots, wheat, beets, celery, fragrant fava beans, and of course large sheaths of quinoa seed heads already formed and robust. Each pump fills a tank which serves 11 families who each tend to their own 5,000 square foot garden (1,500 meters). Some use natural manure to strengthen their newly planted soils, others chemical fertilizers. This is the first year the gardens are in use and Gladys is predicting that each family will most likely harvest at least 220 pounds (1 quintal) of quinoa for their personal use. This comes out to a little more than 4 pounds of quinoa consumed by each family each week and seems to be the national average of quinoa consumption for people growing quinoa in both the altiplano and valley regions of Bolivia. People in the quinoa regions consume quinoa about 3 to 4 times a week, usually in soups or toasted and cooked as rice (a dish known as psiga). Fifty years ago, quinoa was consumed daily as a standard family staple, but that habit has changed as homegrown quinoa needs to be hand cleaned which takes time and extra work. To clean home harvested quinoa one has to remove the outer shell of the quinoa seed along with its chaff and then do several rounds of water rinses. This means the quinoa takes extra time to prepare while white rice and dried noodles are now easily accessible for purchase and faster and easier to cook. On our way to the airpumps we paused to pick a tiny plant, the chupala, who’s root, about the size of a crayon, is juicy and sweet to eat raw. We also enjoyed the bright green seeds of the mutucuro, a small, flat legume that produced small round “potatoes” deep in the earth and produces a small red seed pod with tiny bright green seeds inside. The seeds do not have much flavor, but are fun to eat because of their color. We checked on the quinoa too. Noting with a shovel that the weeks of rain had only saturated the top foot of the hilled soils from last year’s quinoa fields, now fallow. It was better if the water had sunk in deeper than that. Never-the-less, the farmer with the tractor was plowing field this week at a cost of $20 per acre (or 400Bs a hectare) and he was coming to plow tomorrow. The field would be plowed now in preparation for October’s planting, to let the organic matter sink in and decompose into nutrients, the humidity of the soil helping in their process. Normally farmers would add two dump truck loads of llama manure to their acreage (a $285 investment) but this field had not been used in 5 years and Gladys felt certain it would be OK for production without extra material added. Everywhere quinoa farmers are looking at ways to cut their costs – with reduced fertilizer usage, less pest control and less acreage in production – the low market prices and climate variations affecting these decisions. The salt flats of Bolivia once were a great inland sea. As the earth rose and he sea dried it became a great salt flat many feet deep. Once known as the Salar of Tunupa and now called the Salar of Uyuni (due to an error made by the conquering Spanish), this region can be seen from the moon, holds the world’s largest supply of lithium plus many other minerals, and houses many rare and carefully adapted life forms. Most of Bolivia’s quinoa production is cultivated on the cold, dry salty soils around the salt flats. But there is another story to the salt flats and this I will share now. Long ago, the volcanoes of the altiplano walked and moved to meet and hold long conversations together. In this desert region, at 12,000 feet above sea level, there was only one female volcano: Tunupa. All other surrounding volcanoes loved her. Tunupa became pregnant and bore a small volcano whose father was unknown. All of the volcanoes that had courted her wanted to be the baby’s father. All night they fought. Finally they took the baby volcano away from his mother and hid him in Colchani . The gods were furious and to punish the volcanoes they took away their right to move, talk and meet. Tunupa had nursed her child, the baby volcano, and loved him very much. Now she could not find him. Volcano Tunupa, like the others, was pinned to the earth and silent in her grief. She did not know that in Colchani, a small volcano that looked much like her, now laments alone on the outskirts of town. Tunupa cried and cried. Her tears and her mother’s milk ran over the arid land that ever since has been white and salty. Thus was born the great white Ténéré; the Salar de Uyuni. Tomorrow I will be traveling with my family through the night, across the altiplano, on a cold, bumpy bus, for 7 hours to arrive at dawn at the salt flats… and the land of quinoa.